Canning Circus was once the industrial playground of Nottingham. Workers from Players and Raleigh would come in their thousands on payday. Today, many of those pubs have gone – but plenty still survive, supported by a vibrant neighbourhood of working professionals, students and migrants from across the world. Starting on Alfreton Road, The Organ Grinder (1) was the Blue Monkey Brewery’s first tap bar. On a cold night you’ll be warmed by the mahoosive log fire, while in the summer, walk to the back of the pub and make your way to the ample roof terrace. 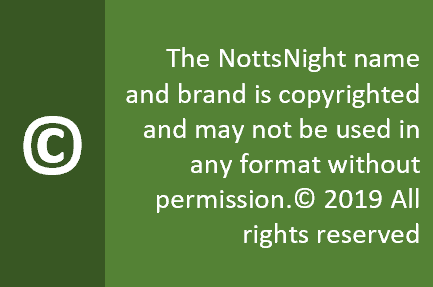 If you walk out of the door on a weekend, you may see (and hear) The Running Horse directly opposite – visit the NottsNight website for more details. But for now, turn right, and next to the aptly named World of Drinks off licence is The Overdraught (2), where you’ll find craft beers on a global scale, along with a great selection of reals ales. Don’t spend too much time trying to count the number of 2p pieces which make up the bar, because there’s supping to be done at arguably the most traditional bar on this trail, The Falcon Inn (3). Another roaring fire will warm you up here, though the place is so small that you’ll feel quite cosy if there are more than about ten customers. Make your way across the car park to The Sir John Borlase Warren (4). The sprawling bar stretches over two levels, with a nice little snug at the back. On a sunny day, walk straight through to one of Nottingham’s great pub gems – a split level beer garden providing equal measures of light and shade. At weekends in the summer, you may struggle to find a seat. As you walk out of the bar, look straight ahead and fork right down Derby Road, making sure you also look up – some of the buildings here have impressive architecture above ground level, and the street has a quirky mix of independent shops. 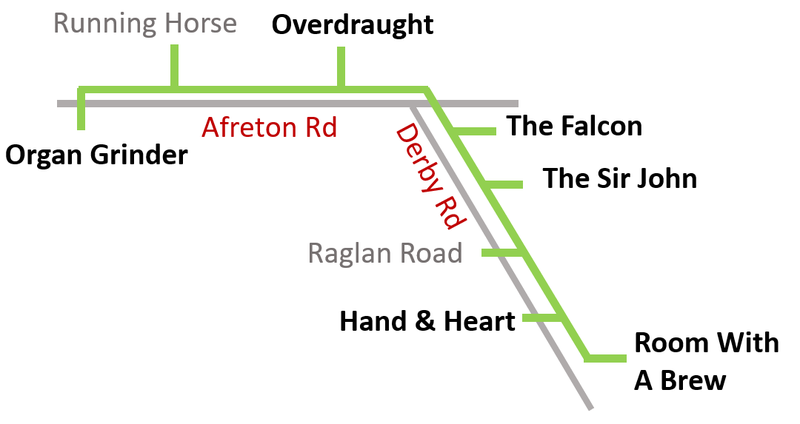 The Raglan Road doesn’t feature on this trail, but is in The NottsNight Underground. Next is The Hand and Heart (5), noted for its caves, live music on Thursdays and impressive food. This is a great place to ignore your phone, as it probably won’t work beyond the front bar. Finally, cross over Derby Road and get some micropub action in A Room With A Brew (6). Run by Stapleford based Scribblers Ales, check ahead for opening times as last orders can sometimes be a bit early. Trent Barton runs frequent bus services from the City Centre and onwards to Beeston, Ilkeston, Derby and Heanor. Nottingham City Transport also runs many services via Canning Circus – look for Turquoise, Orange or Pink routes leaving the city. Tell someone else about this post!